HAMBURG -- Volkswagen AG's plans to add factories and models will ensure "profitable growth" at Europe's biggest carmaker in coming years, CEO Martin Winterkorn said. "We're now laying the foundations for profitable growth in all segments and business fields," Winterkorn said today at the carmaker's annual shareholders meeting in Hamburg. "VW moved into the fast lane in 2010; that's where we intend to keep the company in coming years." 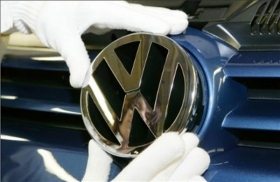 VW will introduce about 30 models and vehicle upgrades in the coming months across its brands, which include luxury division Audi and Czech unit Skoda, Winterkorn said. VW is expanding operations in China and will open a U.S. factory in Chattanooga, Tennessee, on May 24. VW is counting on growth in Brazil, Russia, India and China to help surpass Toyota Motor Corp. as the world's biggest carmaker no later than 2018. VW has forecast global sales will increase 5 percent this year after reporting a record 7.2 million deliveries of cars, sport-utility vehicles and vans in 2010. The German manufacturer said April 27 that earnings before interest and tax more than tripled to 2.91 billion euros ($4.3 billion) in the first quarter from 848 million euros a year earlier. Sales rose 31 percent to 37.5 billion euros. "In light of this, 2011 looks set to be a good year despite the economic uncertainties," Winterkorn said today. "Both for the automotive industry and for Volkswagen." Winterkorn reiterated last week that rising demand in China will help boost revenue and Ebit this year. VW's Chinese joint ventures, which aren't included in the group's operating profit, contributed an additional 557 million euros in first-quarter earnings. Global deliveries of cars, sport-utility vehicles and vans at VW, which is merging with sports-car manufacturer Porsche SE, rose 14 percent last quarter to 1.99 million vehicles. Net income increased to 1.6 billion euros from 423 million euros a year earlier.